Going on a family holiday doesn’t mean the parents are stuck eating damper (not that you can’t make some delicious camp damper!) or whatever else they packed. You can still taste the delicious food that the Byron Bay Area offers while dining at restaurants that your kids will like too. Check out our list of five places to get you started thinking about how many mouth-watering meals you can fit in during the next holiday here. Kids love pizza, and Earth ‘n’ Sea Pizza isn’t just any old pizza, so parents will enjoy themselves too. The slogan for the restaurant reads, “At Earth ‘n’ Sea, we do not make Italian style pizzas. We make Byron Bay style pizzas,” and this means all pizzas are made using a wholemeal base. Depending on your children’s ages, you might want to get pizza that the whole family can split (there are some excellent innovative toppings like fresh prawns, bananas and pineapple), or you may want to check out the children’s menu on offer. And the bonus? There are crayons and colouring pages available to entertain the kids while you wait for the delicious pizza. Here’s another place that parents can feel good about taking the kids—can we say playground? Live animals to watch? Area to run around while you wait? And oh, for the parents, there’s local produce on a seasonal menu, 56 taps of Australian craft beers and mostly organic/biodynamic wines and a store on hand to buy some fresh bread and milk after dinner. The Farm, located just outside of Byron Bay in Ewingsdale, likes visitors to check out the actual farm and see where a lot of the food on the menu was grown. Breakfast and lunch is available seven days a week from 7 am to 3 pm, and dinner is served from 5 to 9 pm Friday through Sunday. Want a place where the kids can literally eat a delicious burger and run around outside? Or perhaps dine on some delicious brekkie while you drink your coffee and enjoy watching the early morning surfers head to the beach? Heck, get it all as takeaway and head to the beach where you can actually watch the surfers in action as they take on one of Byron Bay’s well known surfing destinations, The Pass. Both locals and tourists love Top Shop, and for good reason. It’s another excellent place to take the kids and still get to partake in the excellent food the Byron Bay Area has to offer. Set the alarm! It’s worth it to grab a table that allows you to see the beach while you sip coffee. Located along Clarkes Beach on Lawson Street, The Byron Beach Café serves up simple options such as granola, fruit and yogurt to larger meals like the eggs Florentine or Mexican rancho eggs. And, of course, since this is a kid-friendly place, there’s a menu just for kids. Also, if you’re not up for the early morning hour, then try out lunch or grab takeaway and head down to the beach instead of just watching from the cafe. Yep, you can have your cake and eat it too at this particular dining establishment. Foodies love Harvest Cafe in Newrybar—the menu changes seasonally, depending on the availability of fresh produce. But they clearly invite kids to the table since you’ll find a toy box available here to entertain the kids while they wait to be seated and for food. So, start thinking about what you might order off the menu that features only organic and sustainable food, such as roast bone marrow and salted ricotta. Definitely worth the drive for you and the kids! 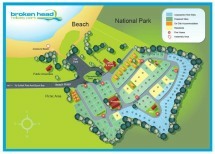 Here at Broken Head Holiday Park, we offer accommodation from unpowered campsites to beach shacks, so there’s bound to be something that will work you and your family. The ages and number of children may well determine the best fit. We also have great facilities on hand, including a camp kitchen with BBQs and an amenities block with a laundry. So start planning your next camping holiday to the Byron Bay Area—school holidays are around the corner!—and look forward to making some awesome memories!